Home » Rhubarb Strawberry Parfaits. Grill Packet Desserts! 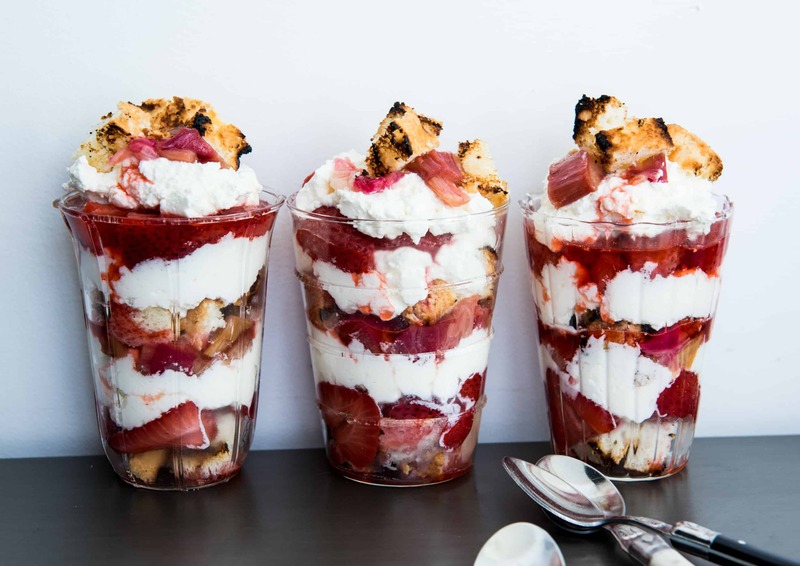 Rhubarb Strawberry Parfaits. Grill Packet Desserts! 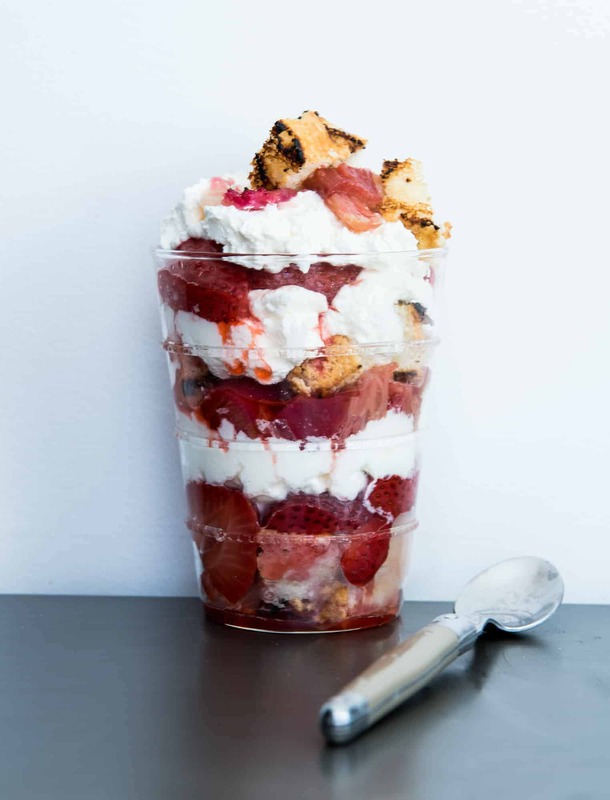 These rhubarb strawberry parfaits are the ultimate camping dessert because you can make them on grill using grill packets! If rhubarb and strawberry aren’t your favorite, then try this recipe with peaches, pineapple or even apples. Only 4 ingredients: fruit, sugar, angel food cake and whipped cream. Summer is on the horizon here in Oakland. The signals are subtle, but I’ve lived here long enough now to pick up on them. In San Diego, May and June are the worst months because the ocean is warming up which causes cool temperatures and a lot of fog. I love May and June in Oakland because the temperature is the same as in San Diego (low 60s generally), but it’s sunny here so I feel less wistful of my old life, and more like I’m winning. Transitioning to a new climate has been the toughest for me. Especially in the summertime. Summer to me is hot, sunny days and nights. Not this cool breeze, long sleeve t-shirt stuff we have going on here in the north. It was pretty depressing at first, but now I’m sort of getting used to it. I keep telling myself that I don’t need anymore sun in my life, it’s only going to cause me to prematurely age. So I’m learning to find summer enjoyment in other ways. Less beach, more hiking in the woods. This strawberry parfait recipe fits perfectly into my new summer norm. 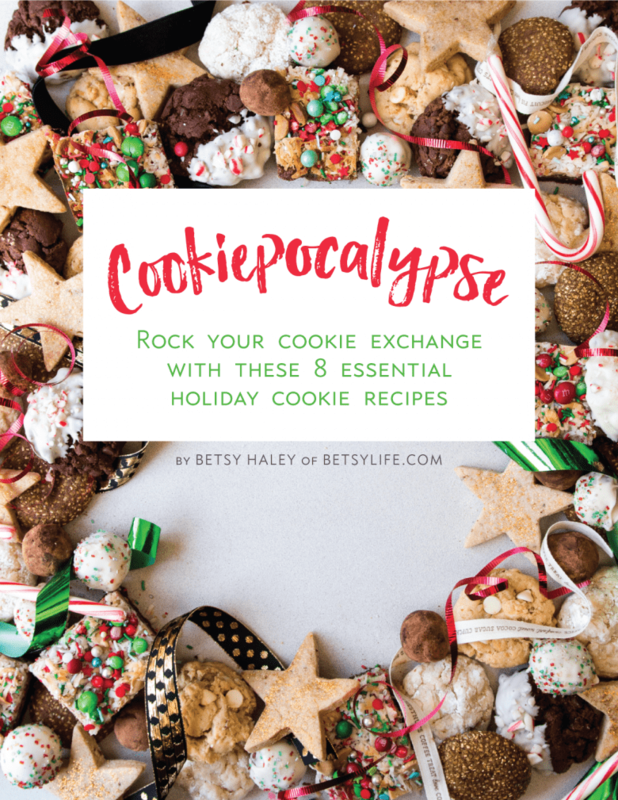 Any seasonal fruit will work wonderfully in this recipe and you can prepare it all on the grill or over a campfire. 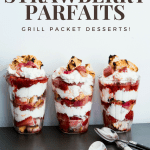 A super simple grill packet dessert that’s perfect for camping trips or other outdoor adventures. 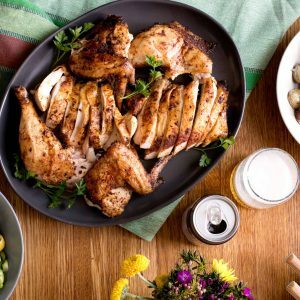 Now that we have a backyard that’s perfectly set up for entertaining, i’m looking forward to having a few festive bbq’s this summer and I’ll definitely be whipping up a few grilled desserts. 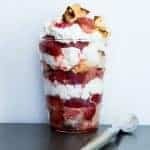 These rhubarb strawberry parfaits are also a great recipe to get kids involved with because they can assemble their own grill packets and parfaits. 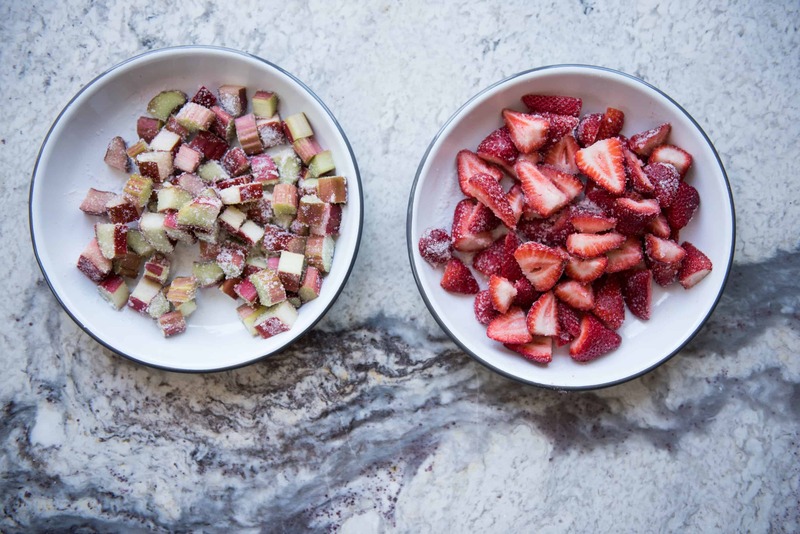 You can prepare the fruit mix ahead of time and quickly assemble right before grilling which is a great time saver when you’re hosting a crowd. Double (triple?) bonus; we still don’t have air conditioning at our house here in Oakland so for the one week of the summer where it gets unbearably hot, we can just fire up the grill and not have to worry about using the oven when we’re already melting. Triple (quadrulple?) bonus: easy clean up!!! Just throw the grill packet away. If you want to wash nothing, assemble these beauties in plastic cups and serve with plastic spoons. Literally no dishes to clean. It doesn’t get much simpler than that. It’s almost summer. It’s getting hot. 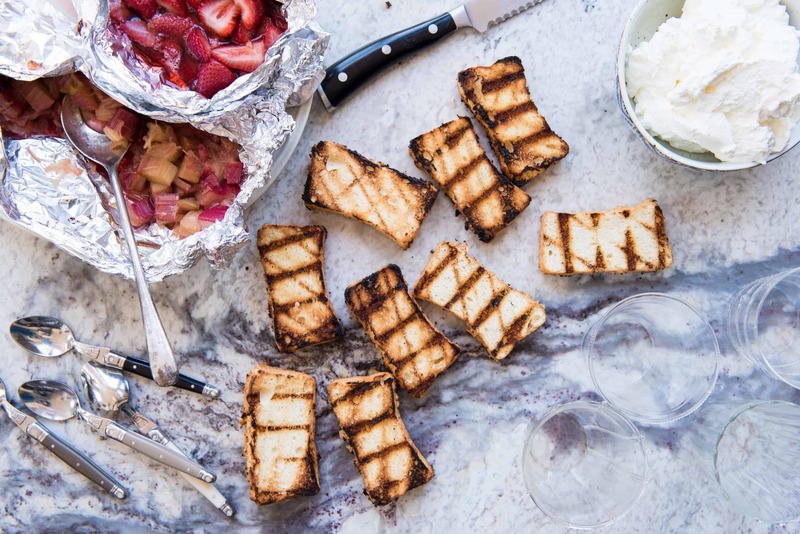 You don’t want to turn on the oven so grill cooking is on your mind but what about dessert? Make these fresh and seasonal rhubarb strawberry parfaits on the grill with the rest of your meal in foil grill packets! Zero cleanup and easy to bring with you when you’re out camping or exploring the great outdoors. 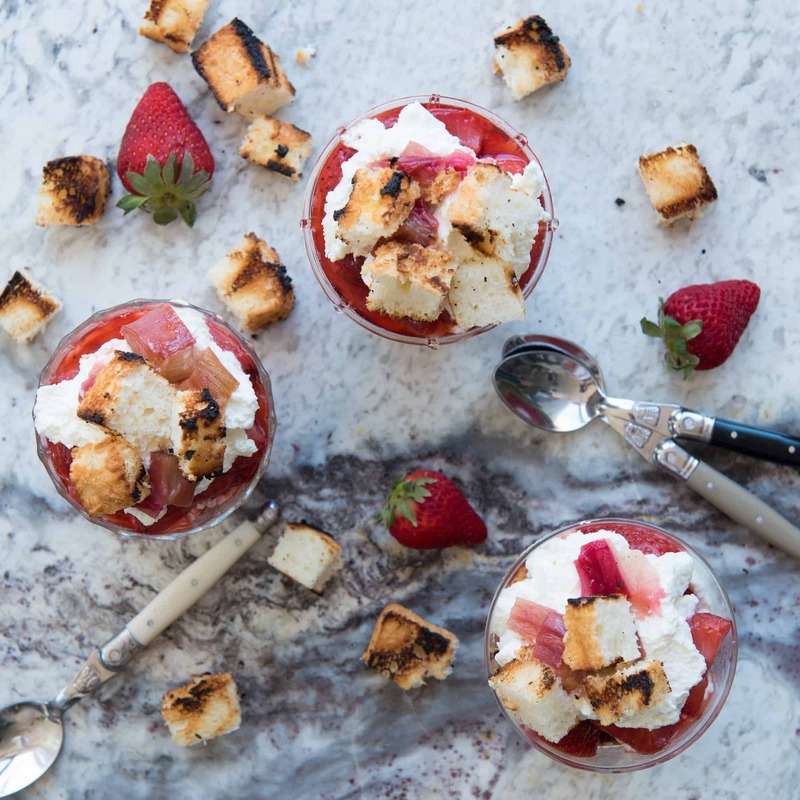 These rhubarb strawberry parfaits are the ultimate camping dessert because you can make them on grill using grill packets! 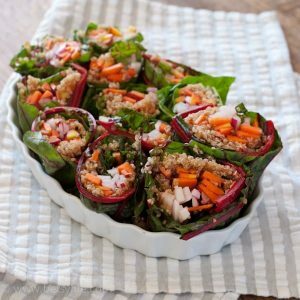 If rhubarb and strawberry aren't your favorite, then try this recipe with peaches, pineapple or even apples! All you need is fruit, sugar, angel food cake and whipped cream. In a medium bowl, toss strawberries with 1/4 cup sugar. Tear a 9X13 piece of aluminum foil and dump strawberry mixture on top. Repeat step one with rhubarb and remaining 1/4 cup of sugar. 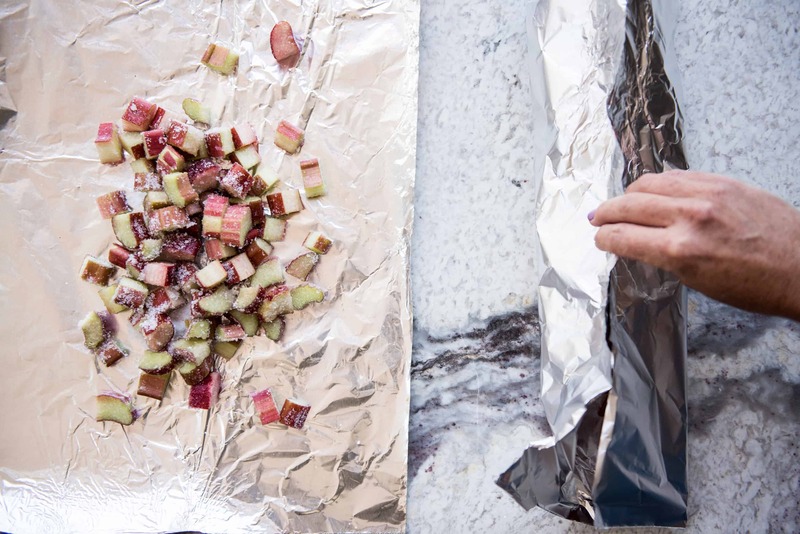 Pinch the edges of each foil packet together firmly and roll up each end to create 2 foil packets. Place packets on a grill over high heat for 4 minutes. Meanwhile, lay slices of angel food cake on the grill with the packets. Grill 2 minutes per side or until lightly charred. Removed cake slices and foil packets from grill. Carefully open to allow steam to escape. Cut the cake into cubes. In a cup or mason jar, layer angel food cake with a spoonful of strawberries and whipped cream. Repeat with rhubarb mixture. Continue layering until jar is full. Serve immediately.